GREYSTONES, Ireland - Sept. 11, 2013 - PRLog -- “I am very pleased to be able to offer a series of six chair yoga classes at the Shoreline Community Centre in Greystones, starting on Thursday 19 September at 11.00am,” says Ann-Marie Larkin of Yoga for Balance. “These classes will be as gentle as my regular viniyoga classes, but are most suitable for those with mobility difficulties, joint problems or who have found regular yoga classes too challenging,” she added. People who will benefit include seniors, those with back or leg problems, even wheelchair users. Chair yoga takes a holistic approach, whereby the joints in the body are taken through their range of movements through simple seated yoga postures in a chair. In addition to the posture work, the class also includes a short, centering breath-work and relaxation. 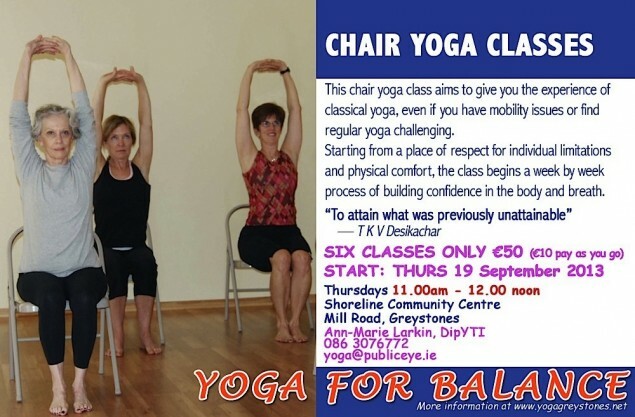 Chair yoga from Yoga for Balance aims to give those with various health problems or limited mobility the beneficial experience of classical Indian yoga. Starting from a place of respect both for the student’s limitations and their comfort, the classes will, week by week, gradually improve mobility and rebuild confidence in the body and the breath. Chair yoga, which allows for seated and other postures, is suitable for those who have found regular yoga classes too challenging. Those who will benefit include seniors, those with back or leg problems or other mobility issues, or who have a wide range of health problems. The physical poses used in chair yoga are an excellent form of exercise and benefit physical movement. Chair yoga is great for those affected by decreased mobility. Weakened muscles become even weaker if they are not used for hours on end. The negative effects include back pain, muscle cramps, weak bones, and joint pain.